Millions of people have experienced urinary incontinence (UI), which is an involuntary leak of urine. UI is a condition that can be slightly bothersome or totally debilitating. For some people, the risk of public embarrassment keeps them from enjoying many activities with their family and friends. Urine loss can also occur during sexual activity and cause tremendous emotional distress. UI has a great impact on quality of life and because the condition is not life-threatening, it does not get the attention that it deserves, from both patients and healthcare providers. The prevalence of UI varies between the genders and also by age. It is more common in women, but certainly does occur in men. The prevalence of UI in men is around half of that in women. It tends to occur in older men due to an enlarged prostate blocking the flow of urine from the bladder. Symptoms of prostatic enlargement, can start in men in their forties. Older women tend to experience UI more often than younger women. However, UI is not inevitable with age. UI occurs because of problems associated with the muscles and nerves that help to hold or release urine. UI will occur if the bladder muscles suddenly contract or the sphincter muscles are not strong enough to hold back urine. Urine may escape with less pressure than usual if the muscles are damaged, causing a change in the position of the bladder. The causes of UI differ between the two genders. The most common causes of UI in women include weakening of the pelvic floor muscle due to factors such as obesity, traumatic or prolonged natural childbirth, chronic cough as in asthmatics or smokers, chronic constipation or following a hysterectomy. Other common causes include menopause and cancer of the cervix or radiation treatment for the cancer. In men, an enlarged prostate is the most common cause of UI. Both men and women can become incontinent from neurologic injury such as trauma to the spinal cord e.g. after a car accident, birth defects, trauma to the brain as with strokes or a head injury and following pelvic surgery, typically for urological or colorectal surgery. Figure 1: Front view of bladder. Weak pelvic muscles in women allow urine leakage (left). 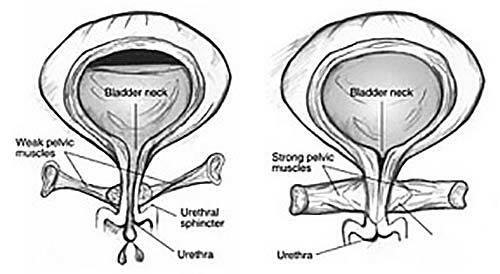 Strong pelvic muscles keep the urethra closed (right). Stress incontinence is the leakage of small amounts of urine during physical movement such as when coughing, sneezing, laughing or exercising. The loss of urine is associated with an increase in intra-abdominal pressure. Physical changes resulting from pregnancy, childbirth and menopause often cause stress incontinence. This type of incontinence is common in women and, in many cases, can be treated. It has been found that 20-30% of young adult women experience UI, which is mostly stress incontinence and that 30-40% of middle-aged women with UI, also typically suffer from stress incontinence. Urge incontinence is the loss of large amounts of urine for no apparent reason after suddenly feeling the need or urge to urinate. Urge incontinence occurs at unexpected times such as during sleep or it may be brought on for example, by hearing water running when turning on a tap. Mixed urinary incontinence is usually the occurrence of stress and urge incontinence together. It is the most common type of urine loss in women, affecting 30-50% of postmenopausal women. Total UI is the continuous loss of urine, throughout the day which is completely unrelated to any event or activity. All of the above types of UI typically occur in women. Overflow UI is an unexpected leakage of small amounts of urine because of a full bladder. It occurs when the bladder doesn’t empty properly, causing it to spill over. Overflow UI typically occurs in men, due to an obstruction to the flow of urine out of the bladder. Weak bladder muscles or a blocked urethra may cause this type of incontinence. Overflow incontinence is rare in women. The older man who is incontinent is normally being looked after by his children, who will insist on him seeking medical attention. Younger woman, however, tend to deal with the condition as best they can by wearing sanitary pads, limiting their fluid intake and activities away from the house and by planning trips out of the house around toilet stops and, if necessary, by allowing her world to contract to the barest minimum contact with the outside world. Treatment options depend on the cause of the UI. Treatment ranges from simple, non-invasive interventions such as physiotherapy to strengthen the pelvic floor muscle to taking medicines to stabilise excessive bladder contractions, to surgery. In certain circumstances, more extensive and invasive surgery may be required to keep the patient dry. Other options include in-dwelling catheters that the patient has inside the bladder all the time or a catheter that a patient passes into their bladder every few hours. Novel treatment options on the horizon for sufferers include urethral bulking agents, botox injections into the bladder and neurostim implantation. Bulking agents are injected into tissues around the bladder neck and urethra to make the tissues thicker and close the bladder opening to reduce stress incontinence. This treatment is ideal for older patients who are not fit for general anaesthesia. The advantage of this treatment is that it can be done as a day case under local anaesthesia and sedation. Over time, the body may slowly eliminate certain bulking agents and the patient may then need a repeat injection within 12 -18 months. A botox injection into the bladder can be done as a day case. It is a less extensive and less invasive procedure than surgery. Patients should be considered for reinjection when the clinical effect of the previous injection has diminished. The botox injection may need to be repeated within 9-12 months. It has a longer duration of action in children. This involves the implantation of an electrode into the spine of patients with symptoms of urgency incontinence not responding to other therapies. Stimulation of nerves to the bladder may be effective in resolving urgency incontinence in some patients.